What is an aqua stop hose and do you have to use it? The words aqua, and stop, are used by a variety of companies covering different products. They all try to “stop” damage from leaking water in various situations. So-called “aqua stop” systems in appliances can combine more than one leak detection system including float switch detectors in the base of the appliance. However, this article deals with questions about the actual aqua stop fill hose supplied with several brands of washing machines and dishwashers (including AEG, Neff, Bosch & Siemens). How does the Aqua-stop hose work? It’s a hose within a hose. The outer hose is made of corrugated plastic designed to contain any water if the inner hose leaks. There is also a plastic housing at the end where it connects to the water tap. If the inner hose ever leaks, then a device inside this housing is able to detect the incident and prevent further water getting into it. If this happens, the hose will no longer let any water through to the appliance and will commonly indicate it has “tripped” via a red dot in a small window in the housing. If this happens the hose is now useless and cannot be repaired. What problems are associated with the aqua-stop hose? This photo was sent to me by Mark. He had to fit a new cold tap with a 90 degree angle pointing down to accommodate the aqua-stop hose. His original tap had extended horizontally like the (no longer required) hot tap behind it. Before changing the tap there was no room to connect the new aqua stop hose. This demonstrates the type of problem many people have when confronted with these larger bulky hoses with specific fitting instructions as described in the main article on the left. Can you replace an aqua stop hose with a normal fill hose? Many aqua stop hoses do nothing different except protect against leaks from itself with a mechanical stop mechanism activated by leaking water inside the hose. You can usually replace them with a normal fill hose if you are prepared to remove this flood protection. However, some aqua stop hoses actually have an electrical solenoid inside them, with wires running through the hose from the washing machine. In this case the aqua stop hose acts like a remote fill valve which would be missing in a normal hose. If the washing machine also has a regular fill solenoid with power running to it, and the aqua stop hose just piggy backs of its electrical power being energised when the main valve is energised, then a normal hose should still work OK.
I’ve seen cases where some manufacturers bizarrely threaten to void your guarantee if you don’t use their hose. This makes no sense at all. The hose protects only against the fill hose bursting or corroding, which is in fact a pretty rare event these days anyway. No one would dispute they have every right to refuse any repairs to the replacement hose you have used instead, and if by any freak chance the split hose sprayed water onto the appliance and caused damage they have no need to fix that either – but it’s not really on to refuse to repair a faulty motor or any other fault on the washing machine unrelated to the fill hose. Having said that, all guarantees are in addition to our statutory rights, and in law, no one has to provide any guarantee whatsoever. Our rights extend only to the Sale of Goods Act. The only reason they give any guarantee is because everyone does, and it’s an important – nay essential – sales tool. No one is likely to buy any appliance with no guarantee. But as it is an addition they are able to try to impose certain restrictions. If we think the restrictions are unreasonable or restrict our “statutory rights” then we can challenge them, and if necessary seek consumer advice or take them to the small claims court. It’s hard to imagine a manufacturer seriously trying to convince a customer with a 3 month old washing machine that they must pay £200 or more to have a new motor fitted simply because the washing machine is connected by a normal fill hose instead of their aqua stop hose, how ridiculous. This article was originally published on Washerhelp.co.uk and had attracted some comments which others may find useful to read. Therefore the first dozen or so comments under this article are the comments I’ve transferred across. How does the aqua stop valve connect inside the washing machine itself? and by removing the connector in side and changing to a regular hose, does anything need linking out? Most Aqua stop hoses just screw onto the washing machine’s fill valve the same as any other hose. Everything that’s different about it is within the hose itself, which is why many can be replaced with a normal hose – although clearly a normal hose will not have anti flood protection. The problem i have is the washing machine does not take in any water, and was working before moving house. 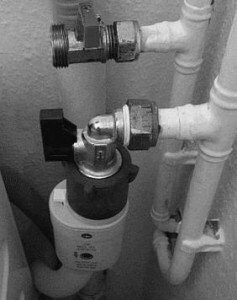 if you disconnect the ‘aqua stop hose’ from the mains water supply pipe on the wall, and turn the water on, water comes out. so the supply is ok. if you connect the ‘aqua stop hose’ to the mains supply on the wall, and unscrew it at the machine end and turn the washing machine on, and turn the water supply on, no water comes through, so i assume the ‘aqua stop’ is active and not allowing the water through. I took the shroud off around the water inlet on the washing machine to expose the water pipe inlet which is just a normal screw type washing machine water supply hose within the ‘aqua stop hose’ and there is a cable that runs through pipe down to the valve at the water supply end, the cover on the water supply end is marked ‘240v’ etc. At the machine end the wire goes inside and obviously connects inside the machine to power the ‘aqua stop’. my question is: if i unplug this wire and remove the ‘aqua stop hose’ completely and replace with a standard washing machine hose will the machine be looking for feedback from the aqua stop? Hello Tom. More common Aqua stop hoses are self contained and need no power to work. They are just a hose within a hose and if the inner hose leaks it stops the hose taking water in (presumably by the water physically operating a mechanism that stops the water going through the hose). When these aqua stop hoses have failed they should show a red dot in the small plastic window on the main section. The way yours is fitted there’s obviously an electric solenoid in the aqua-hose, which is energised from the machine. If you left the electrical connections on when you unscrewed it from the machine, and no water went into the washing machine when it should have been filling then it would imply the aqua stop hose is faulty. However, it’s theoretically possible some other fault could stop the valve getting power or a neutral return and account for no water going into the machine. If the valve on the actual washing machine which you screw the hose onto has its own solenoid, and its own power supply (so in effect the aqua stop hose is just piggy-backed onto the regular solenoid) then a normal hose may work ok. I’ll update my article to mention that some of these devices have their own power supply. Thanks Washerhelp. I will try a standard hose tonight and i will let you know the result. i assume the mechanical type aqua stop hoses use some kind of venturi chamber, and when the water pressure drops (due to a leak), the valve closes. Hi I’ve just come across your site and hope you may be able to help. I’ve just bought a Hotpoint LFT228 integrated dishwasher – to replace a Hotpoint LFT114 model; the cost of replacing the door seals made a replacement the best option. The new machine has an aqua stop hose (searching for this brought me to your site and the very useful info about these) whereas the previous model had a standard washing machine stle hose. At the dishwasher end, the hose is built into the machine, making it impossible to replace this with the standard hose – which I had left in place from the old dishwasher, hoping to simply reconnect to the new dishwasher with a minimum of fuss. It looks like I will now need to create a much larger hole in the site of the undersink cupboard for the aqua hose head to be passed through – as well as re-jigging the direction of the source tap to accommodate the plastic box at the end of the aqua stop hose – as in the photo in your article about this. But, is there another way? I’ve managed to buy a plastic screwthread 3/4″ male-to-male barrel which would allow the existing hose to remain in place, connected to the water supply but allow me to join the new aqua stop hose to this at a convenient point behind the dishwasher. The question is – would extending the length of hose between the water supply point and the dishwasher in this way have any affect on the filling of the machine – or create any other problems? The length of hose would be over two metres. I spoke to Hotpoint this morning, but their service team weren’t a great help – and suggested the dishwasher “might not fill up and simply not work”. The man was very keen to try and sell me an extended warranty though… I’d really appreciate your thoughts or suggestions as you clearly know a lot about such things. We have a new AEG washing machine that has an Aqua-stop fill hose. Two questions: 1. The water supply pipe terminates upwards so the aqua-stop is upside down. Will it still work? 2. It leaks but when I tried to disconnect the hose at the water supply end the aqua-stop and union nut rotate together until the aqua-stop hits the wall, so I can’t disconnect as they two parts will not rotate independently. When connecting it I noticed that there is some sort of ratchet mechanism so is there a way of switching it do rotate anti-clockwise? Kevin: Are you sure the hose on the new dishwasher is built into the machine? They often disappear inside the machine but can still be screwed onto a valve underneath. Dishwashers can be very awkward to work on though. Regarding extending the hose, it would depend on the water pressure at your house. If it’s strong enough it would probably work OK if most of the hose was laid on the floor and didn’t go up too high. If not, it’s possible you could get reduced water flow and the dishwasher could time out on fill. In my old house I had my washing machine connected to about 2 metres of extended hose and it worked perfectly. You could just connect another normal hose to the new one. Using the aqua hose is best, but if connecting to another standard hose it sort of defeats the purpose of having an aqua hose supply the appliance although arguably you still would have half the hose protected . Richard: These aqua hoses can be a right pain. The one on my father in law’s Siemens washing machine was always leaking from the main part and I had similar problems with the ratchet system and found it very hard to tighten properly. I ended up replacing it with a standard hose after several leaks and “fixes”. I don’t think they are supposed to be fitted upside down. What does it say in the instruction book? They normally specify exactly how it should be fitted. I have a 6-year old Siemens washing machine (model E12-14 in Germany, possibly also known as 12E140 elsewhere). About 3 weeks ago I found water leaking from where the aquastop connects to the water input in the wall. I turned the water input off, and thought nothing of it again. But the next time I tried to use the machine, no water would pour into the machine (I had remembered to turn the tap back on). Hello Patrice: If the washing machine is making a buzzing noise when it’s trying to fill with water that sounds like it is energising the water valve but no water is coming through the valve. It might be the water valve which is buzzing. If so, it sounds like when you put the new hose on and water flows through it properly the washer should work OK.
My aquastop hose shows the red dot in the indicator, and does not let any water come out. Even if i connect it direct to the tap. How can this be repaired ?…Is this covered under guarantee for the hose. Rahul. if the red dot is showing then the hose is useless and unrepairable. If the washing machine is under guarantee it should be covered. We have an eight-month-old AEG washer drier (L75480WD) with an Aqua Control device hose. Like Richard a few posts above our pipework has been fitted to a vertical source pipe, water coming up. Last week the kitchen flooded and the fault seems to lie with this hose (the little metal mesh filter has actually rusted / rotted through!). We’ve been speaking to AEG and they are sending someone out on Weds, (today is Monday) but doing a little research on the net brought us to this site where you seem to advocate the hose pointing downwards rather than up like ours. The instructions make absolutely no mention of essential direction fitting, although the images do show downward fitting. Info is hard to come by. Surely if it was essential to be fitted a certain way round the manufacturer would actually say so? Yes if essential it should be made clear. I’ve definitely seen instructions on some that said they should point down but if there’s nothing like that in the instructions they can’t really say anything. That’s what we think too – fingers crossed they agree! You appear to be the only credible source of knowledge on the aquastop issues, so hopefully you can help. I have a Miele G2670SCVI with a knackered aquastop hose. I have removed the hose and disconnected the electrical connector. Do you know if this Miele model has a regular solenoid inside the machine (meaning I can replace the aquastop hose with a standard one)? Or am I faced with an expensive parts purchase?? Hi Jamie. The electrical connector clearly shows there is a solenoid inside the Aqua stop device which is activated from the washing machine. The hose however still has to screw onto a water valve. It’s just whether or not this is a normal valve and the Aqua stop device piggybacks off of it or if it is just a connecting valve with no actual solenoid. You will need to remove the lead to check. If it is a normal valve it will have a solenoid with two connectors and maybe the Aqua stop device just takes its power from when this valve is energised. If this is the case an normal hose should still work. However, if this was the case then the solenoid would potentially burnout if activated at the same time as the Aqua hose if the Aqua hose valve wasn’t letting any water flow to it. Some great advice here thank you. I have an AEG Dishwasher 40860. There is no water coming in and a code comes up saying i10. I checked in the manual and it says it is the hose filter and to clean it out. I disconnected the hose and took out the plastic mesh and then the other plastic and rubber stop. How do I clean the rest of the hose filter as you can’t seem to take it off the hose to clean it. Any advice on how to clean it? Hi Andy so glad I found you, I have neff slimline dishwasher can’t find a model no. But having looked through your other comments it seems that my aqua pipe is shot, I want to remove and replace with standard washing machine/ dishwasher hose but am concerned about the electric side of it. I haven’t had a look yet as extracting the machine from newly fitted kitchen is going to be mammoth task, could you tell me how the electric wire that runs through the pipe to the box thing at the end is attached to the machine I’m presuming I can’t just snip it off. Thank you very much. Hi jonathon. If an Aqua stop system has built in wires, then the inlet valve is incorporated inside the device. If the device only lets water in when it’s energised by the appliance then clearly a fault elsewhere on the appliance could also account for it not working. Some Aqua stop hoses let water through all the time unless an internal leak triggers it. These hoses can be replaced with a normal hose if you are prepared to accept a normal hose doesn’t have the protection. However, I wouldn’t try to replace an Aqua stop hose with a normal one if it has wires inside which connect to the appliance. Thanks Andy, the aqua stop is leaking from the water supply end of things, the machine works fine, but drips, do aqua stop pipes need fitting to water supply a certain way ie: vertically, horizontally, mine is fitted horizontally, could it be the o ring in the brass connector,if not would a new aqua stop cure the problem . Yes Jonathon, my article lists that as one of the problems with them. They often need to be fitted in ways that some people’s plumbing won’t allow. They normally need to be pointing down like in the photo on the right column of this article. It’s possible that it’s only leaking because of strain.